It had been about a year, actually over a year since I had my hair done. I've had a trim here and there but only a little at home coloring during the winter. 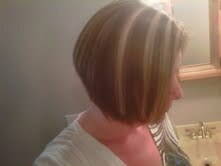 I finally made an appointment and got some racing stripes for the summer. The NSV came when sitting in the chair, draped up with the smock with flat wet hair against my face..I could actually look at my reflection without wanting to look away. In the past, UGH! my neck would be hanging over the collar and cheeks always seemed so huge when they would comb your hair straight for the cut. I would always divert my gaze...Not this time! Woot for NSV's! Lookin' good! Congrats on the NSV! I love it....and very summery! 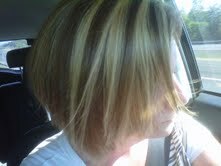 oohhh pretty :) I like the blond highlights. I know exactly what you mean with the reflection!! What a huge NSV. I LOVE your hair. The highlights are fantastic. 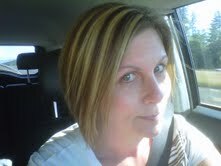 Love the new 'do' - looks fantastic! 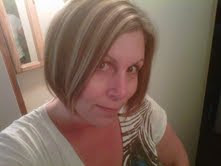 Love the color and the cut! You look gorgeous!! The "racing stripes" bit made me laugh. You look so good, and I look forward to the day when I look in the mirror at the hair salon and don't want to cry. I'm sure it's coming! So beutiful! Who is that girl? It's YOU! You look polished and en vogue. Nice.